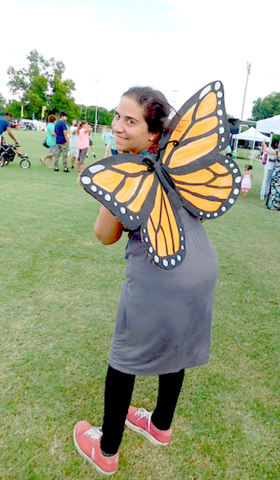 Another Monarch Get Your Play on Day in Garland, Texas! The day began in the beautiful Garland Community Garden at 8 AM! 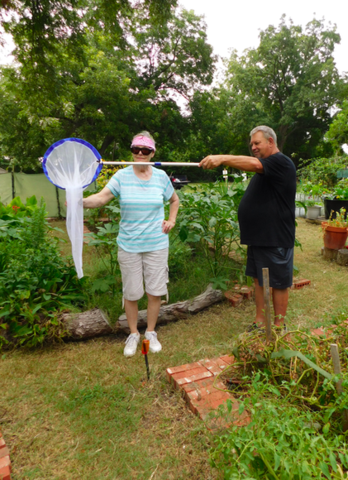 Saturday, July 29, 2017 was an important date: Last Saturday of the Month cleanup at the garden; First day of the International Monarch Monitoring Blitz - Bio-surveillance of Monarchs in summer habitat to measure Monarch density in the garden. We will check milkweed in the garden and in our home gardens between July 29th and August 5th. [Specifically, we will look for monarch eggs, caterpillars, and chrysalises, and report our observations to the Monarch Larva Monitoring Project (MLMP) at the University of Minnesota]; and finally we ended the day by attending a GET YOUR PLAY ON event Family Night Out in Garland’s Central Park with food, fun, fireworks and a live band, “Downtown Fever.” This was the last in a series of events hosted throughout the month of July by the Garland Parks and Recreation team. 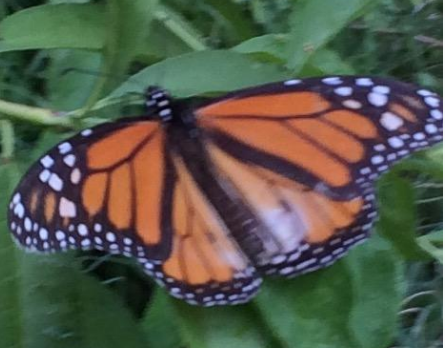 First Monarch (male) confirmed in Garland Community Garden, migrating south – July 28, 2017 – First migrating Monarch confirmed in Garland July 14, 2017 – a female who also laid eggs, which are now pupas (July 29th). There were none observed on the milkweed stands we are monitoring down at the garden today. However, I’m guessing that we will have some caterpillars to report before the end of the observation period (August 5) associated with the Citizen Science project. 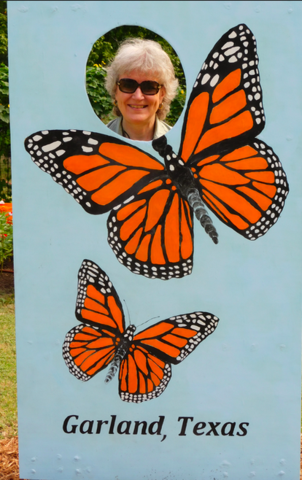 It is a blitz observation time with the purpose of capturing a snapshot of what is happening—not only in Texas, but all along the Monarchs migration corridor which in the USA runs roughly 100 miles either side of Interstate 35. 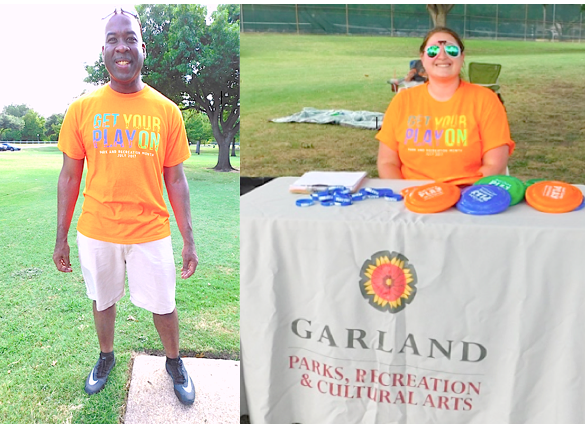 GETTING OUR PLAY ON IN CENTRAL PARK OF GARLAND TEXAS- a great way to end the day. There is lots of opportunity to have fun, get healthy and learn in our community. These opportunities are ongoing throughout the year and the invitation is extended to residents of all ages. Jermel Stevenson is the man who brings it altogether with his leadership and wide experience in city parks and recreation services. The Parks, Recreation & Cultural Arts Department (PRCAD) manages and oversees programs at City recreation facilities, including the Granville Arts Center and Plaza Theatre. The park system contains more than 2,800 acres of parks and open spaces. PRCAD operates six recreation centers, two senior centers, three swimming pools, Surf and Swim wave pool and Jack Coleman tennis center. It was fun to listen to live music and watch families having fun tonight in Central Park, our oldest City park—a lovely expanse of fifty acres. Although there were several hundred people there, we all had plenty of room—just the way we like it in Garland. As always, I enjoyed visiting with my friends from Keep Garland Beautiful and catching up on the news in their organization and their lives. Garland is a great place to live if you like the advantages of a small town without sacrificing the conveniences and other benefits offered by an urban setting.